1812-15 Napoleonic war of 1812. Commodity prices fell and stayed low for a long time. 1850 Alfred apprenticed to Lamport and Holt, well-known Liverpool merchant house. 1850's Liverpool merchants began to replace sailing ships with small steam ones. 1857 Alfred Booth went to New York. Worked for Liverpool merchants Rathbone & Co.
1859-62 Bad harvests in UK lead to food imports from US through to 65. 1860 Elder Mr. Booth died. 1860 Walden (USA) and Alfred Booth (Liverpool, UK) founded company to import light leather from UK to USA, 57 Bond Street, New York. 1863 Walden becomes incapacitated and Walden and Booth dissolved. Alfred Booth and Company, Liverpool and Booth and Company, New York established. This new Booth partnership formed, shipping light leather to the US. Two products: Sumac tanned sheep from Bermondsey for shoe uppers and pickled grains and fleshes from Turneys of Trent Bridge, Boots of Leicester and Johnston at Bootle. 1863 Issue of confederate loan. 1863 Open office in Liverpool 5 India Buildings. 1864 Decided to enter the steamship business. Plan to sail to North Brazil ports, Ceará, Maranham and Para (Now called Fortaleza, Sâo Luiz and Belam): return cargos would be cotton, sugar and coffee. Plus a mail contract if possible. The construction of two steamships, the Augustine and the Jerome was planned. 1865 Booth US trade had a good year. 1865 Turneys agrees to ship to US on consignment. 1865 Contracts placed for first two Booth ships, Augustine launched. 1866 February 15th. first Augustine voyage to Brazil. Voyage lost £3000 but obtained £10,000 annual contract for mail from the Brazilians. 1867 Alfred Booth Lydia Butler. 1869-71 Alfred Booth stayed in the US. 1870 Franco-Prussian war breaks out. 1870 Charles married Mary Macaulay. 1870 Office opened in Boston to build on success of Roan business (pickled foreign sheepskins) 141 Purchase Street, Boston. Mr. Gaenslen went to be manager. 1877 Office opened in London to deal with French and Belgian sheep suppliers Fenchurch Street. 1877 Kent and Steven's tannery in Gloversville hit by Stevens fraud. Booths owed $70,000. Booths pay off creditors and back John Kent. John Kent is the leather scientist who developed fat liquoring and the Dongola tannage. 1879 Problem of unsold stocks of roans leads to opening of showroom in New York, Frankfurt Street. 1879 Dongola tannage successful and Booths begin buying dried goat and Kangaroo skins for it. 1879 Liverpool offices move from 5 India Buildings to 14 Castle Street. 1880 Launch of Daisy Kid Cear#225; goat tanned with Dongola tannage to make an imitation kid. 1880 Augustus Schultz started work with Julius Kutter in Booth Gloversville on perfecting chrome tanning. 1881 Booth steamship Co. Ltd. formally incorporated, began looking at Brazil-New York trade. 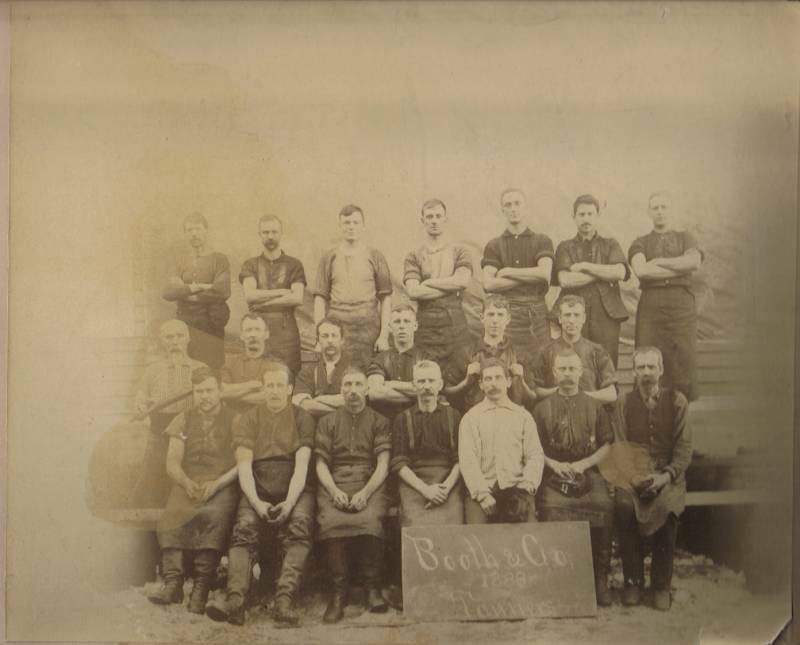 1882 Nuneaton Leather Co. founded when Booths needed to make something out of the Roans. 1884 Augustus Schultz had two chrome tanning patents issued. 1889 Schultz' two chrome patents passed to Franco-American company Messrs Blumenthol. Blumenthal then passed patents to Marcus Beebe and R. Foederer & Co. in Philadelphia. Philadelphia tanners began working widely with chrome. 1890 First serious marketing of chrome tanned leather under the brand name of 'Surpass' by Booth and Company in a joint venture with J. P. Mathieu of Philadelphia USA. (A small production of 'Vici' kid did precede it. 1893 Formation of the United States Leather Company, the largest US Company ever formed. 1894 Booth Gloversville tannery started chrome tanning for Goat and Kangaroo. 1896 Daily output at J. P. Mathieu rose to 600 - 700 dozen skins. 1898 Daily output at J. P. Mathieu rose to 1000 - 1200 dozen skins. 1898 Introduction of enamel process by George S. Wolff to copy patent leather. Sold by Booths as 'ideal'. Wolff Process Leather Company, Summerdale Station, Philadelphia & Reading R. R. @One of the greatest and finest leather factories in the world, especially equipped for producing 'Ideal Leather,' a non breakable enameled leather patented by George S. Wolff, founder and president of the company. The entire output is handled by Booth and Co., N. Y. 1899 Warehouse set up for Surpass UK and European sales in 50, St. Thomas Street, Bermondsey. 1899 Joseph Turney Wood discovers artificial bates. 1902 Sales office opened in St. Louis (701 Lucas Avenue) to deal with the growing shoe industry, quickly followed by Cincinnati and Rochester. 1903 Daily out at J. P. Mathieu rose to 1500 dozen. 18904 Booths supported building Wolff Process Leather Company in Summerdale near Philadelphia. 1905 Booths move to complete purchase of J. P. Matieu and change name to Surpass Leather. 1915 Lusitania sinks in the Atlantic and was likely attacked since carrying arms under the name of Booth sheepskins. Paul Crompton and his family were on board. He was VP of Surpass Leather Company, a partner in the firm of Alfred Booth and Company and a director of the Booth Steamship Company. 1920 Walden (USA) and Alfred Booth (Liverpool, UK) founded company to import light leather from UK to USA, 57 Bond Street, New York. 1860 Booth established UK links to Pavlova Leather, a gloving tannery in Abingdon, Wade and Company in Nottingham to chrome tan kid for the boot and shoe industry and consolidated an interest in the glue and gelatine through a holding in B. Cannon and Company, Lincoln. 1920 British Leather Manufacturers Research Association founded. 1921 Alfred Booth and Company purchases the Pavlova Leather Company of Abingdon, England. 1922 Tanners Council of America established in New York. 138 Strike in Gloversville. Gloversville closed. 1948 Booth purchase Melrose Tannery in Beverley, Yorkshire. 1950/60's Tanneries built in Kenya, Nigeria and New Zealand as joint venture operations. 1960/70's Control of Kemya and New Zealand lost. Booth Overseas continues buying chemicals and machinery for Nigeria and trading some of the Kenyan sides in the UK. 1966 Surpass Leather closed and Booth US HQ moves to Peabody, MASS. 1977 Mr. Alan Cecil joins Booth and Co, Turney Bros. Nottingham. 1979 Booth group sold to Garner group, renamed Garner Booth. Turney Bros. closed. 1987 Garner Booth bought by Pittards plc and renamed Pittard Garner. 1993 Pavlova Leather in Abingdon is closed, leaving only the fellmongers in Scotland associated with Booth England as the manufacturing remainder of the Booth group. 1994 Pittards exit the US office which is retained by the existing management as Booth & Co. Inc.
1998 Pittards start marketing natural leather not tanned with chromium, following on after non-chromium tannages being used extensively in the automobile upholstery business. Copyright © Booth & Co.